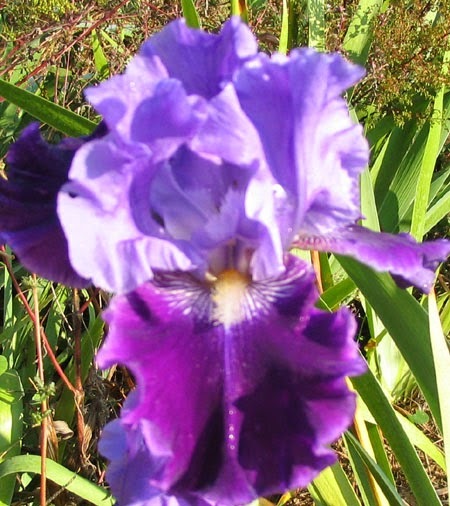 Sometimes I see a photo of an iris online and what catches my eye is not the flower, but the setting. I come back to these photos and study them, trying to figure out how to achieve that look in my own garden. Here today I have posted some garden photos from various iris growers around the Internet, so that you can dream a bit and get some inspiration for your own garden Eden. Santa Cruz, California is a beautiful part of the state with a world-class university and spectacular views of the Pacific and the mountains. It gets decent rainfall for California. 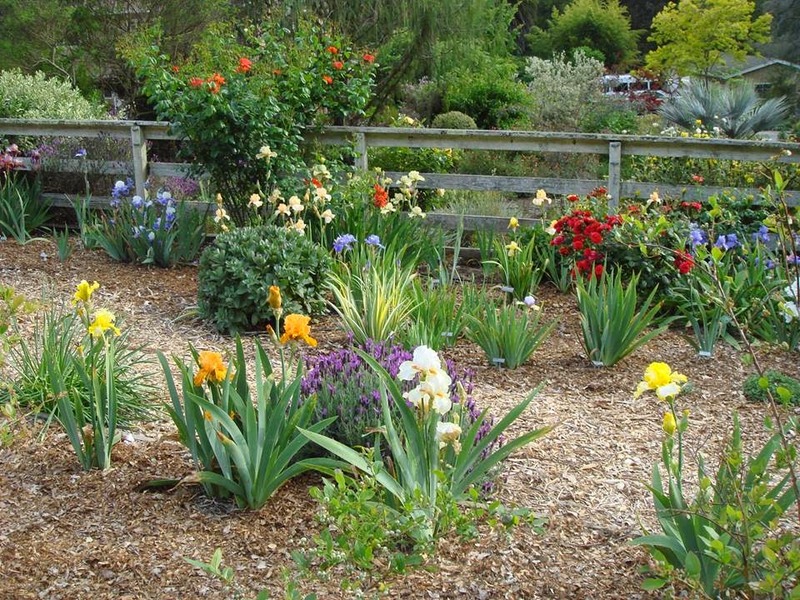 Sherry Austin has created a sprawling garden that features huge clumps of Pacific Coast and Tall Bearded Irises, many of the latter historics. In addition to being a talented gardener, Sherry is an accomplished musician who specializes in folk music. You can hear her for yourself by visiting the website of her group, Henhouse. 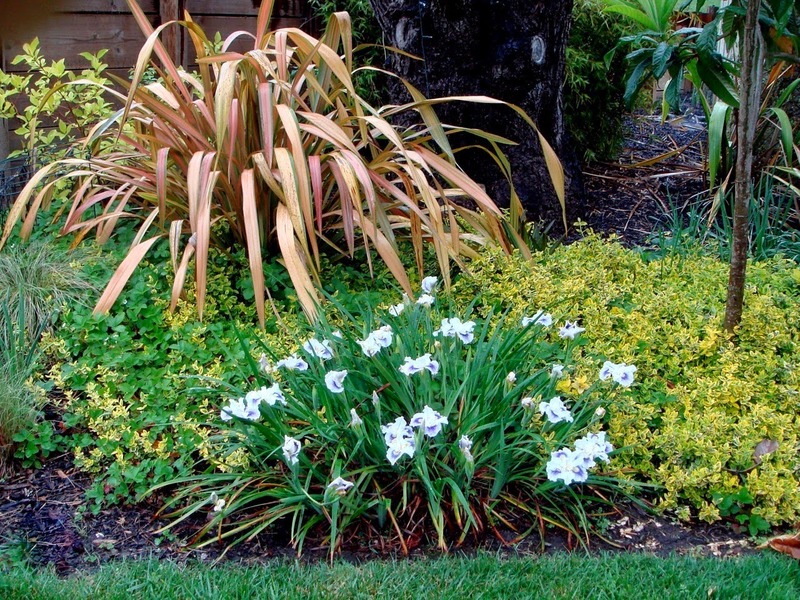 In this photo, Sherry mixes New Zealand Flax, sedum, and Pacific Coast Irises in her landscape. 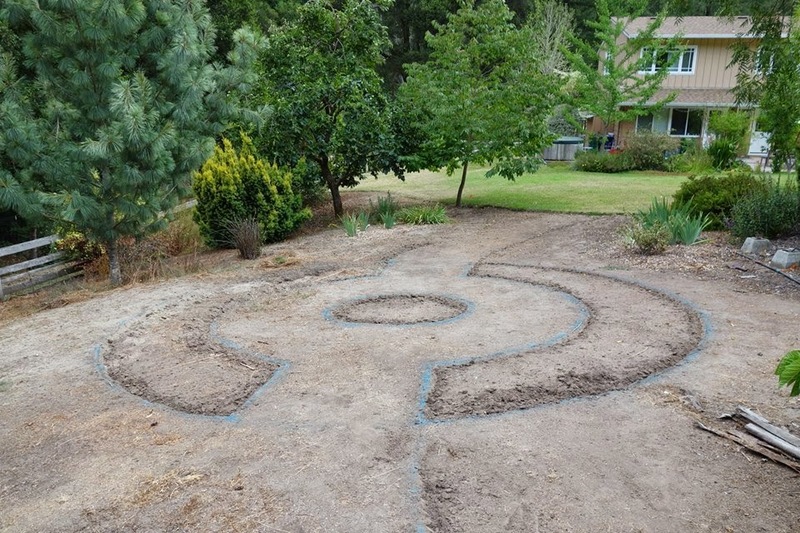 Below is Sherry's "vegetable" garden. Some of you may have "vegetable" gardens that look like this. From left to right: 'Indian Chief,' 'Whispering Falls', and in the back, 'Aureo variegata'. The roses are 'Fred Loads' and 'Sherry', and they are planted with Lavendula stoechys 'Otto Quast', dahlias, nepeta, sedum, and calendula. 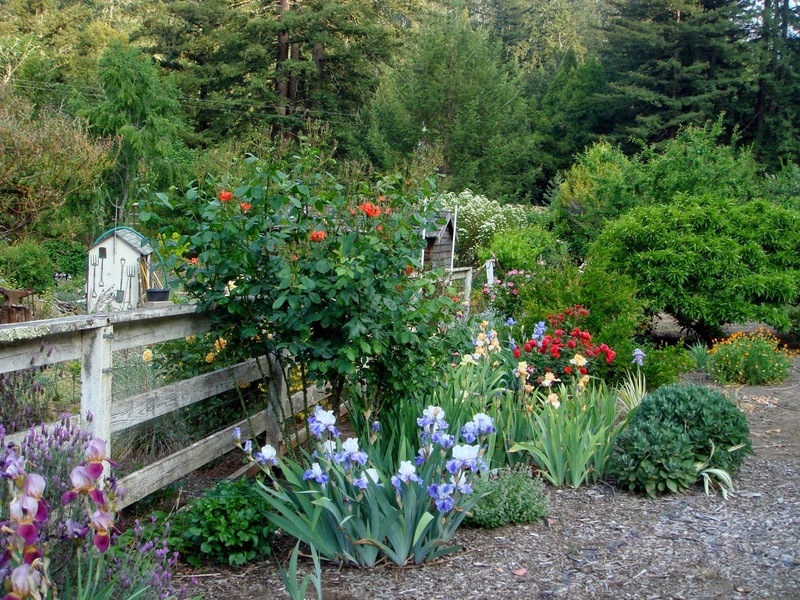 I love the wooden fence with the big clumps of irises. 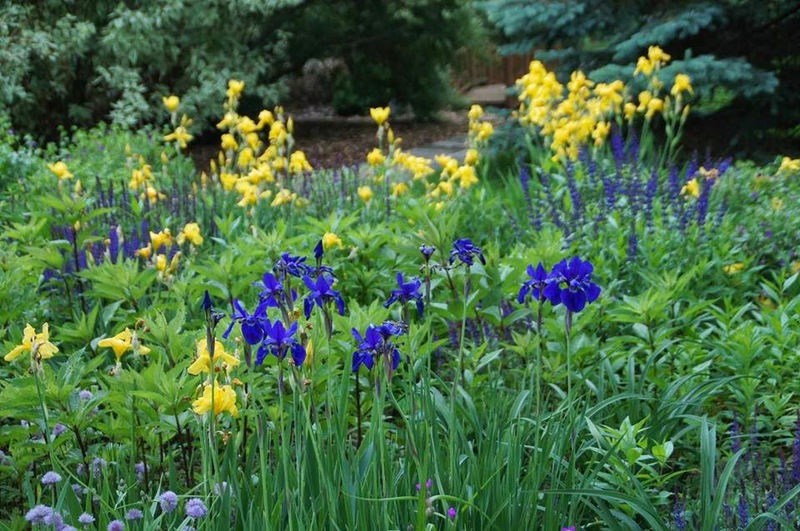 Sherry has big plans for next year, with over a hundred new irises waiting to be planted. I can't wait to see the photos next year! Joel Schaber is an artist and calligrapher who gardens in Boise, Idaho, and who chooses irises based on plant growth habit and beauty of foliage as well as scent and bloom. 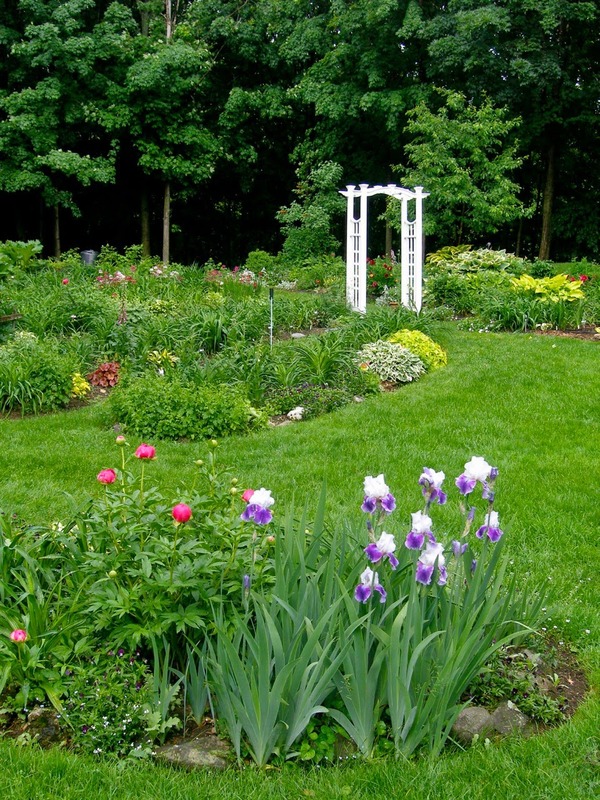 His gardens are meticulously planned, planted, and maintained. He has little time for poorly performing plants, as his garden attests. Here is Intermediate Bearded Iris 'Harmonium' with chives, ferns, hostas and the shasta daisy 'Becky' (not yet in bloom). Here Joel uses 'Edith Wolford' (his favorite) with Asiatic lilies and California poppies. A spectacular coordinated color display is created with 'Rhinelander', 'Paul Black', Centranthus ruber, and campanula. In this bed, Joel uses (from left to right) 'Rhinelander', 'Sun Fun', 'World Premier', and 'Cheap Frills' in front, with 'Orinoco Flow' in the background. The companion plants include red Centranthus ruber (aka Jupiter's Beard or Valerian) and shasta daisy 'Becky'. Can you believe the show put on by 'Orinoco Flow'? The Centranthus ruber, California poppies, and shasta daisies tie Joel's beds together, and here they are joined by Siberian iris 'Caesar's Brother' and a yellow mini rose. Pauline Lavigne has extensive cottage-style gardens with spectacular structures, all tied together with wide swaths of lawn and charming paths. 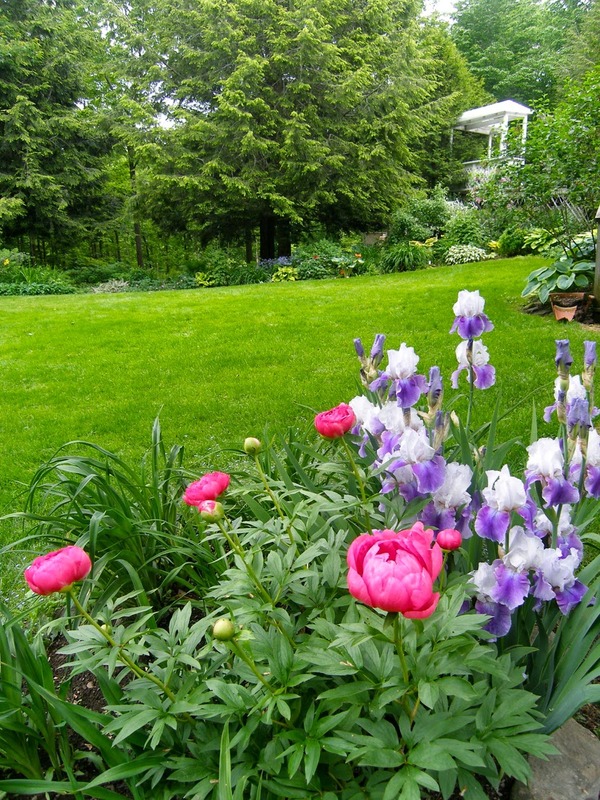 Pauline gardens in Canada, where she grows peonies, daylilies, hostas, and irises, as well as countless other flowers and plants. The jaw-dropping photo below is what first brought her garden to my attention. Here is the standard dwarf bearded iris 'Cherry Garden', which is the second iris to bloom in Pauline's garden, after iris cristata. Here's a different view of that first peony/iris combination. You can see the hostas in the background. 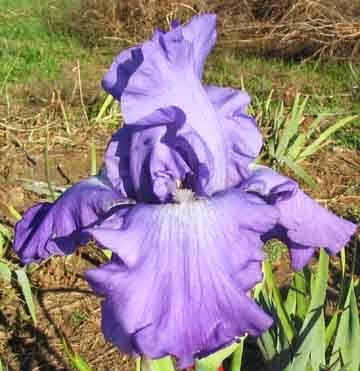 And this is another shot of the great garden iris 'Caesar's Brother', an exceptional siberian iris that will even grow in hot inland Southern California. What a color combination! This iris is the near-green 'County Cork' looking spectacular with chartreuse sedum. 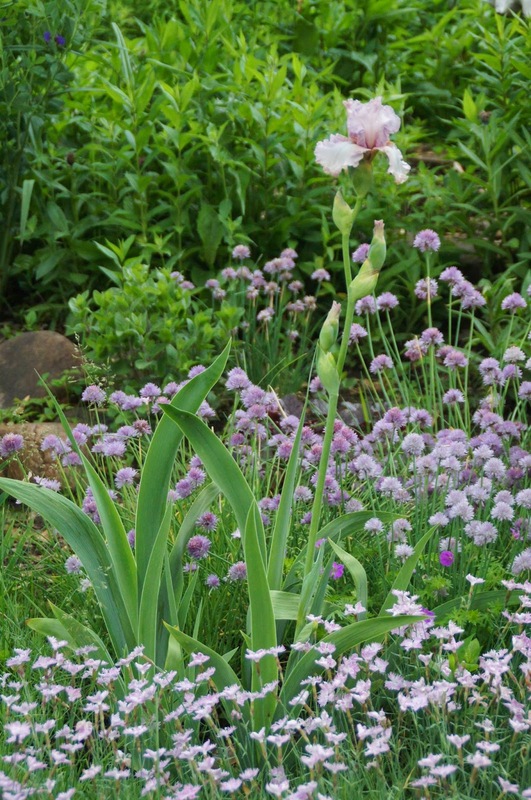 A cool pink tall bearded iris with chives for a fairy-tale effect. I hope you enjoyed these gardens as much as I did. 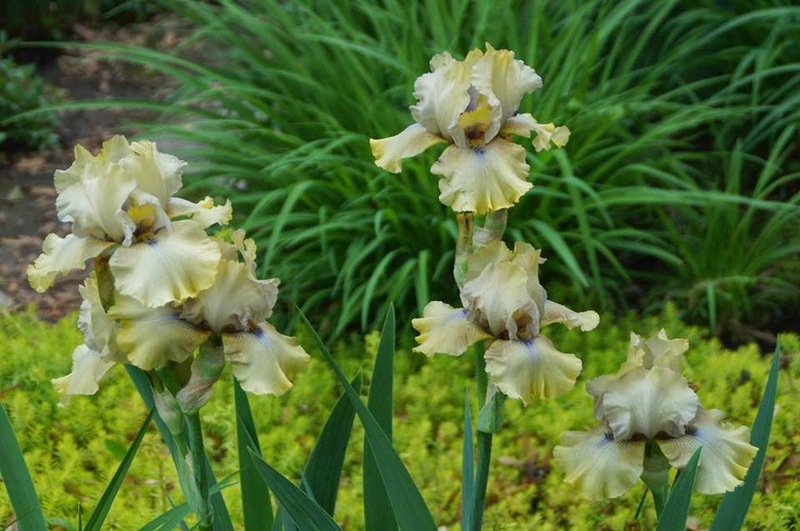 Do you use irises in your garden, or do you plant them in separate beds? Leave a comment below, and good luck finding spots for all of those rhizomes appearing in the mail this summer and fall! The shortest point between two objects is a straight line. If you want to create rebloomers, even fall rebloomers, you need to cross two rebloomers. 'Feed Back' and 'Violet Miracle' were a part of my early collection. They are both purple and were quite popular at the time. 'Feed Back' produced many rebloom stalks throughout the summer, but often produced short stalks. 'Violet Miracle' is tall and well branched but doesn't rebloom a lot in my garden. A cross between the two seemed to be a reasonable path. A direct hit came from crossing 'Feed Back' x 'Violet Miracle' which produced 'Star Gate,' which has great branching, a great bud count, and reblooms in many zones within the US. I would have preferred to reverse this cross but it just didn't happen. 'Star Gate', though, has helped produce a number of rebloomer seedlings in various shades of purple and white. Two of these reblooming seedlings produced my rebloomers 'Another Bridge' and 'Theme Master.' CF2-1Re: (A1-1Re: ('Autumn Encore' x 'Roman Lover') x 'Feed Back') X G18-1Re: (E38-1: ('Orbiter' x 'Feed Back') x 'Violet Classic'). The three strongest seedlings survived and all three rebloomed, but only these two were introduced. Most of these have been used, with various success, in an attempt to produce red rebloomers. 'Star Gate' has produced many red seedlings still being used in my red program. Only the future will tell what may result. When I first collected Pacifica iris seeds, I learned the hard way to let them dry thoroughly before packing seeds into envelopes. Several packages of fresh seeds developed mold! 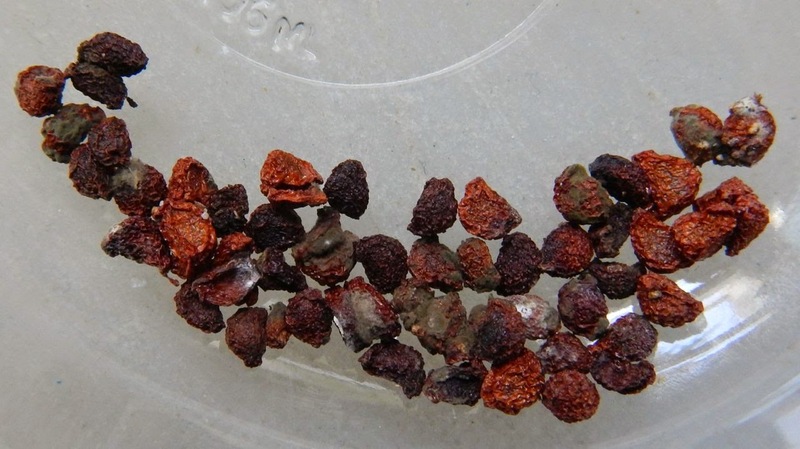 Seeds need ten days to two weeks of patient drying time from pod to package. Gardening is not only a creative physical and visual practice, it's a constant practice of patience––and a lesson I keep returning to again and again, apparently I'm a slow learner when it comes to patience. Ripe Pacifica Iris pod with moldy seeds, right from the garden. This whitish mold is in the seed coat, not the seed. The seeds will germinate despite the mold. I quickly learned that no matter how dry the pod, the seeds needed their own drying time once they were decanted. The following images show the transition from fresh, damp seeds to dry seeds that can be packaged safely. Fresh seeds, right out of the pod: Smooth and light colored, these seeds need to dry for a couple of weeks. Seeds are usually light brown as they come from the pod; they can be greenish, yellow, gold, or even pink. These seeds will feel damp in your hand. 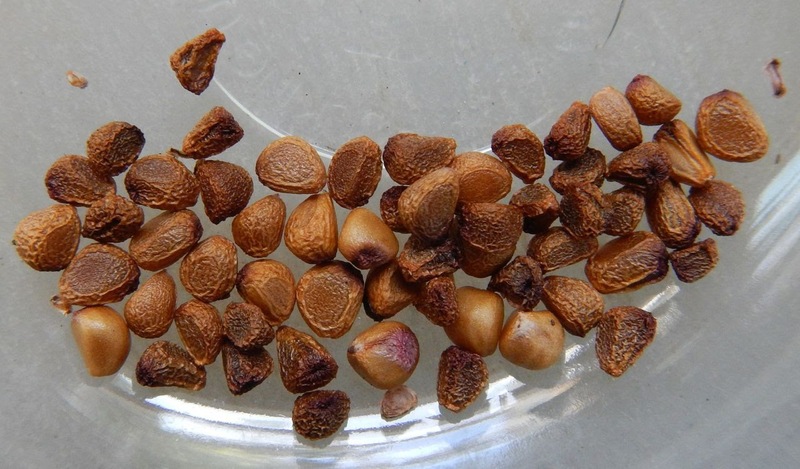 If you are planting Pacifica Iris seeds right away, skip drying and plant them out. Pacifica Iris seeds can live when stored cool for several years, so if you plan to store them, then take the time to dry them first. Seeds ripen as they dry down, are more resistant to cold, and last longer in storage. Partially dry, these seeds are starting to darken. 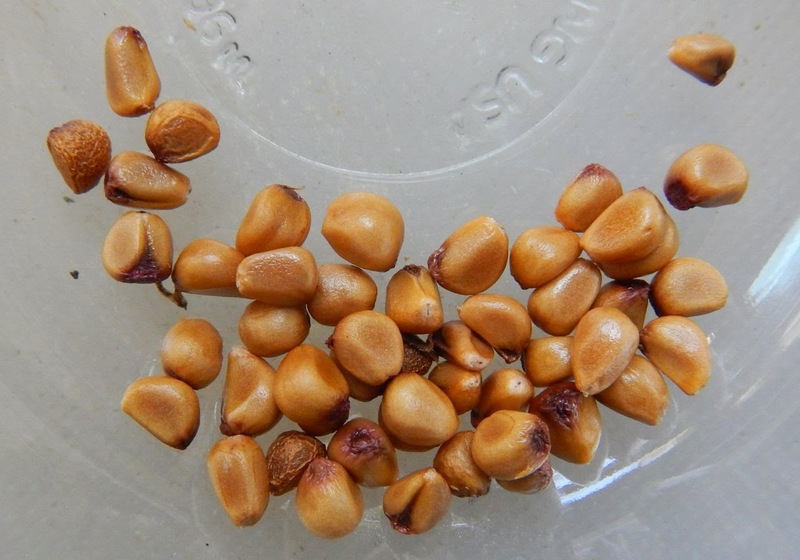 As the seeds dry, they darken and develop patterned seed coats. 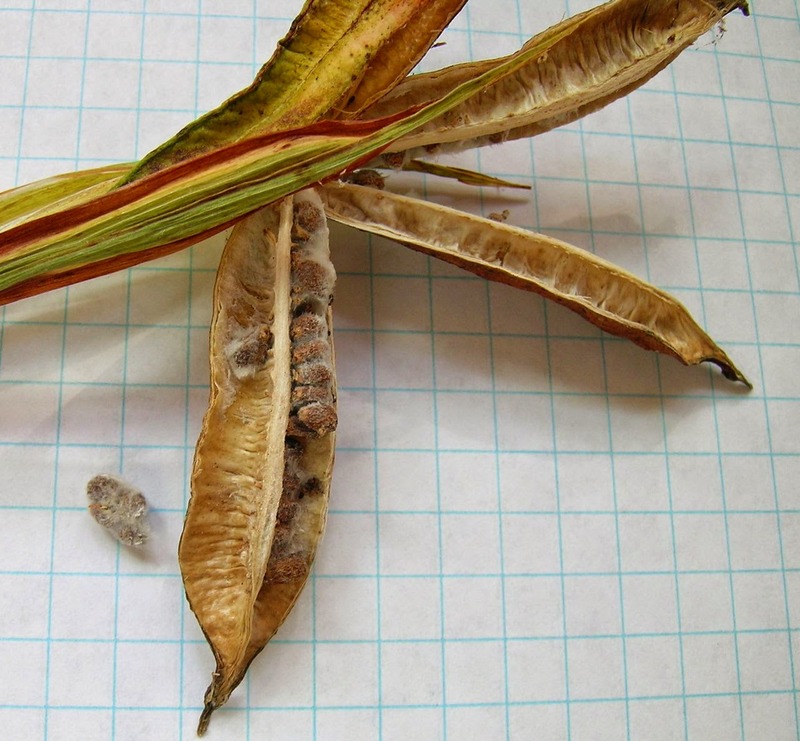 The partially dry seeds, shown above, will still feel slightly damp in your hand. They are still too damp to store. Be patient. Let them dry a few more days to a week. Finally dry enough to package and send off in the mail to a seed exchange. Thoroughly dry seeds are light, feel dry to the touch, and are medium brown to dark brown to black in color. The seeds in the photo above are dry enough to put in envelopes and store, or mail to a seed exchange. These are extra pods. Note the brown pod at top with loose ripe seeds above it. Another hard lesson was that not all seeds are needed by seed exchanges. One year, I hand cleaned a leaf bag (one of those large black yard trash bags) full of pods of Iris douglasiana seeds––there must have been eight to ten ounces of seed by the time I was done. The seed chairman that year cheerfully used the seeds as extras where those ordering wanted vigorous species-type seeds. Nowadays I count pods and rarely collect more than 10 pods of any one variety, which will give more than 120 seeds. On the low end, I aim for at least 2 pods, or 20-30 seeds, as a minimum donation of one variety, unless it's something I know only a few people will want. I have one pod coming on a rare iris and will share seeds directly with those who want it, if I get more than 10 seeds from that single pod. If you save seeds for seed exchanges, think about how many seeds to send in. Seed chairs typically want to send out at least 5 seeds of each variety, and if they get only 10 seeds of anything, then only two orders can be filled. These days, I clip off extra seed pods and compost them, or toss the seeds out in a rough meadow. Someday I may have a mixed meadow of grasses and irises in that part of my garden. 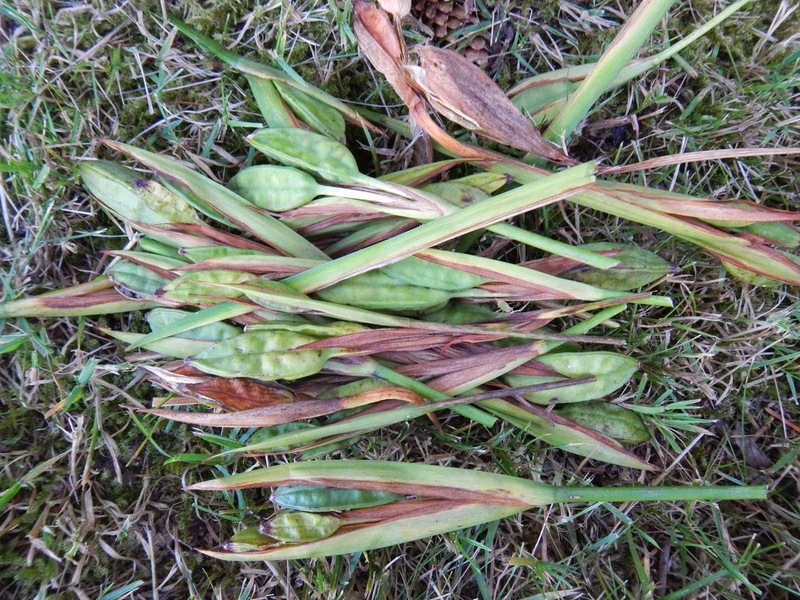 I also toss them on the lawn by the iris beds, the seeds in the photo above may germinate where they fell. Seeds are a promise of plants to come. Every time I collect seeds, plant them, and grow new plants, it feels like a blessing from nature. When those new plants bloom and set seed in turn, it's the great wheel of life turning in my own garden, year after year. Crocus is a well known and much beloved member of the Iris family. There are dozens of species and hundreds of varieties in a range of colors and sizes. One of them, C. banaticus, was previously called Crocus iridiflorus, or the Iris Flowered Crocus. Unfortunately C. banaticus was proven to be the older name so we are stuck with it. Its popularity would be much greater if it were still C. iridiflorus. 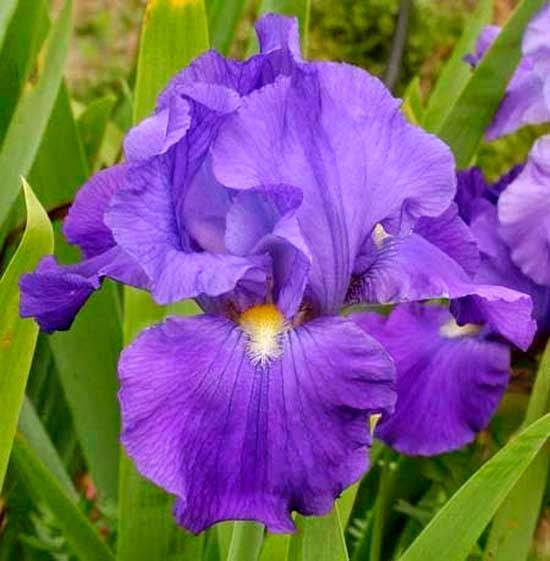 The reason it was called Iris flowered is due to the differing size of the tepals. In all other Crocus they are the same size. Here the smaller inner tepals look more like standards and the larger outer tepals appear more like falls than in any other Crocus. Of course there aren't any style arms like in Iris, instead it has a much branched stigma. While usually a pale lavender there are darker forms like the one above and also a beautiful white. I am at a loss to understand why I have not been able to grow a white flowered one as the others have been easy here in Kansas City. C. banaticus even self sows but never as much as I would like. While it is a fall flowering Crocus the foliage does not emerge until spring. The leaves are sharply keeled and lack the silver stripe found on most Crocus. It hails from the Balkans and is perfectly adapted to a continental climate. This Crocus is readily available from many flower bulb dealers and is a long lived and fun addition to the garden. 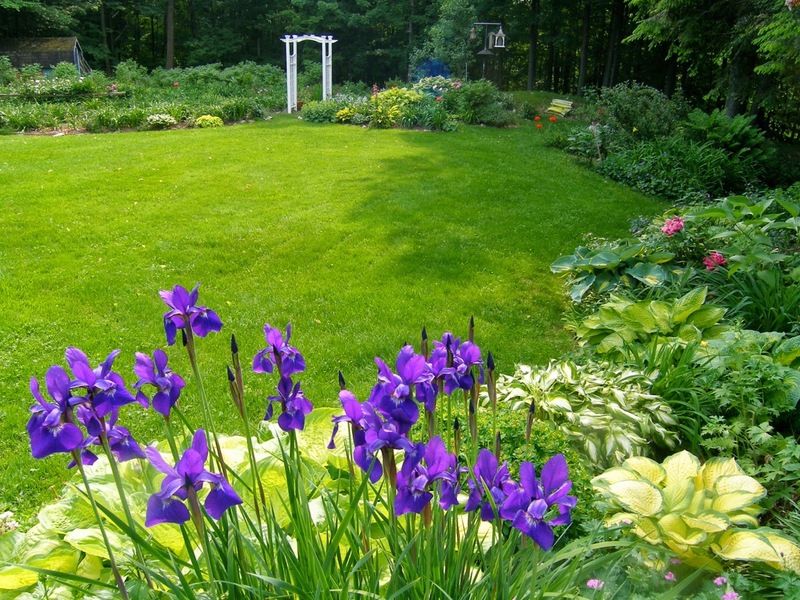 Give it a try and you will be rewarded every fall with a bouquet of Iris Flowered Crocus. 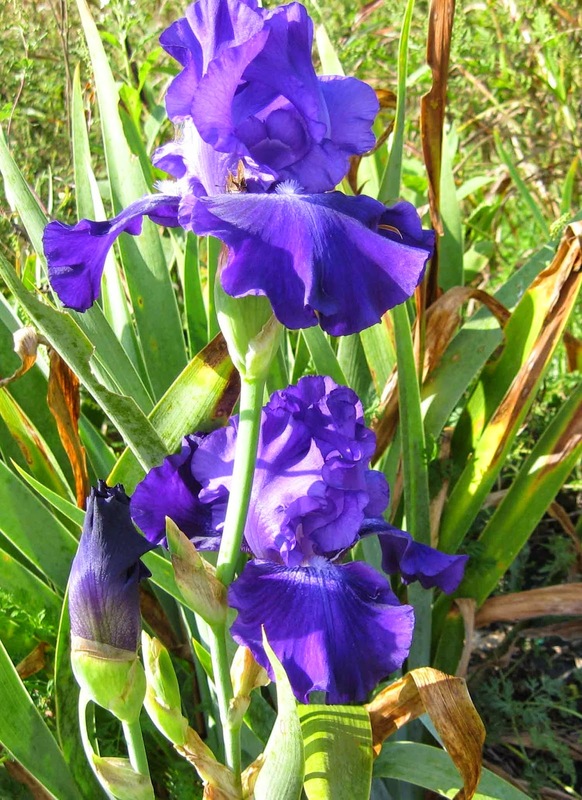 Looking at photographs of your irises is one way to enjoy your irises beyond the bloom season. I would like to share pictures of my favorite pinks, but I have so many that I will have do it in two parts. This beauty has a fine gilt edge on it. You don't see it until the sun hits it and then it is an eyelash wide line of gold on the edges of both the falls and the standards. Oh My! This was my first bloom year for this iris and it took my breath away. It has extravagant ruffling. Many of my "pinks" have a lot of shrimp color in them. In the garden I still label them as pinks. So I am grouping them together. 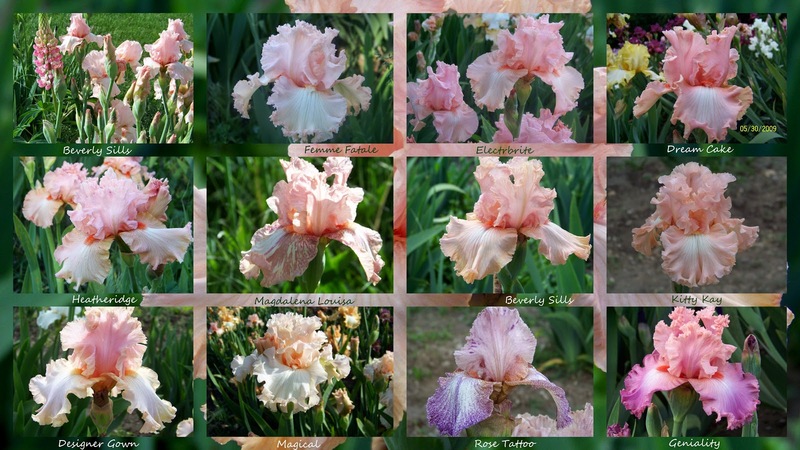 It is only in a collage or viewing the photographs and iris side by side that you see that there is a slight orange or shrimp colored cast. Sometimes I grow similar colors together so that I can see the subtle color difference. It also makes a bigger splash of color. Here is a collage of colors side by side to show differences in pinks and corals, and shrimp. This one is one of my husband's favorites irises. It grows well here. This one is aptly named because it seems lit from within. This has long been in my top 25 irises. It is rather short at 31 inches. It also doesn't increase as well as lots of others but the colors are worth it. It has both ruffling and lacing. This one has a lavendar flush where the standards and falls come together. This is another that my husband likes. Some years it has a lot of tattooing and other years it doesn't. This is one of my clearest pinks that has no shrimp or orange cast. It looks beautiful in the garden planted next to pure yellow and cornflower blue. This iris has a really pretty form. I have had trouble with the plant itself. The leaves are not hardy and the plant itself doesn't increase very fast. But oh, what a bloom! The hot coral beard and the veining make this one a tour stopper. This is the first year for it to bloom in my garden. It won a right to stay. This one has a lot of shrimp coloring in it and reminds me of "Beverly Sills" who is one of its parents. I heard that Brad named this one after his mother. It is a lovely broken color iris. I was a little fearful of broken color at first and this one seemed more subtle than 'Bewilderbeast' and 'Hot Dogs and Mustard'. 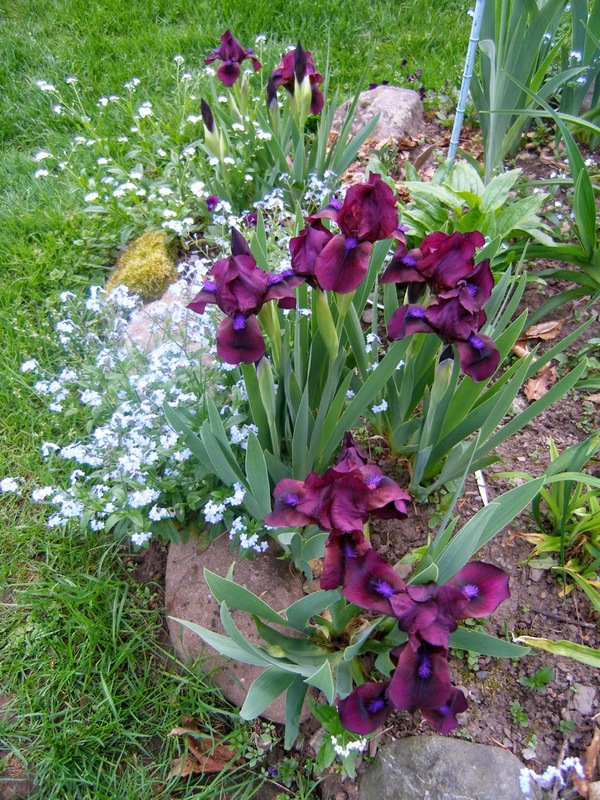 I like lots of the broken color irises now and with Zebra Gardens just 21 miles north of me I can buy all I want until the money runs out, my husband's patience runs out or we run out of room. I know this looks like many others but how do you resist the name? 'Femme Fatale' By Gatty, 1988. She posed for this one at 10:34 am. I will continue with more favorite pinks in my next post. Which of these do you like most? Which pinks do you like best in your garden?